Jeffrey Hellmer, John Fremgen (conductor); Bryan Kennard (flute); Andre Galuban, Matt Maldonado (alto saxophone); Dave Sayers, Jessica Mortensen (tenor saxophone); Sarah Milligan (baritone saxophone); Joe Jennis, Jonah Arias, Tamara Vaughn, Thomas Abercrombie (trumpet); Aaron Garcia, Altin Sencalar, David Kapral, Tyler Smolovik (trombone); Ben Zeff (guitar); Austin Thomas (piano); Chase Goldman (bass); Greg Clifford (drums). 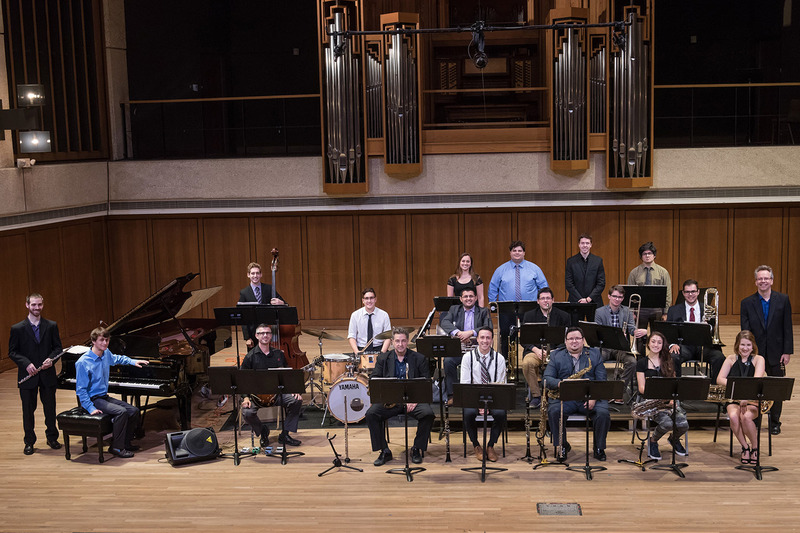 The University of Texas Jazz Orchestra, conducted by Jeff Hellmer, is the Austin, Texas Butler School of Music’s premiere jazz ensemble. The repertoire features compositions of its members, along with the music of Count Basie and Duke Ellington. The ensemble has performed with luminaries such as Jeff “Tain” Watts, Michael Brecker, Stefon Harris, Terell Stafford, Chris Potter, John Clayton, and Maria Schneider in recent years. The Jazz Orchestra’s latest recording is In The Thick Of It.